Police chief: "I wish we had juggled some matters involved in this affair differently"
London (CNN) -- The widening phone-hacking scandal that brought down one of Britain's biggest newspapers claimed two more casualties Sunday as authorities arrested the paper's former editor, Rebekah Brooks, and London's police chief announced plans to resign. "As commissioner, I carry ultimately responsibility for the position we find ourselves in. With hindsight, I wish we had juggled some matters involved in this affair differently. I didn't and that's it," Metropolitan Police Commissioner Sir Paul Stephenson told reporters. His announcement came hours after authorities arrested former News of the World editor Brooks in connection with British police investigations into phone hacking and police bribery, her spokesman said. Brooks was released around midnight, but it remained unclear whether she would testify as scheduled Tuesday at a House of Commons hearing on the scandal. Stephenson stressed Sunday that he had behaved ethically, but said he decided to resign because increased scrutiny connected to the case would burden his department and detract from its accomplishments. "I have taken this decision as a consequence of the ongoing speculation and accusations relating to the Met's links with News International at a senior level," said Stephenson, who became commissioner in 2009 of the Metropolitan Police, which also is known as Scotland Yard. Stephenson's announcement came a day before British Home Secretary Theresa May is scheduled to make a statement to British lawmakers about relations between the Metropolitan Police and a former executive editor of the News of the World who was arrested last week in connection with the phone-hacking scandal. The former editor, Neil Wallis, became a communications consultant to the Met after leaving the paper. On Sunday, Stephenson denied accusations that the department suspected Wallis' involvement in phone-hacking when they hired him as a consultant. "I had no knowledge of the extent of this disgraceful practice and the repugnant nature of the selection of victims that is now emerging, nor of its apparent reach into senior levels," Stephenson said. "I saw senior figures from News International providing evidence that the misbehavior was confined to a rogue few and not known about at the top." The Scotland Yard chief also denied that his free stay at an expensive spa earlier this year had anything to do with Wallis' connection with the resort, Champneys. In a statement earlier Sunday, the Met said Stephenson's stay was arranged by the resort's managing director, who is a personal family friend. "There has been no impropriety and I am extremely happy with what I did and the reasons for it. ... The attempt to represent this in a negative way is both cynical and disappointing," Stephenson said. British Prime Minister David Cameron issued a statement Sunday praising Stephenson for his "long and distinguished career." "While I know that today must be a very sad occasion for him, I respect and understand his decision to leave the Met, and I wish him well for the future," he said. He added that Metropolitan Police investigators must "do everything possible to ensure the investigations into phone hacking and alleged police corruption proceed with all speed, with full public confidence and with all the necessary leadership and resources to bring them to an effective conclusion." Earlier Sunday, authorities arrested Brooks. She was being quizzed by police in London after having come in by appointment, a Metropolitan Police spokesman said. The police agency does not release names of suspects arrested and police officials referred CNN to a statement describing an unnamed 43-year-old woman's release when asked whether Brooks remained in custody. Brooks' spokesman told CNN she was released shortly before midnight and was at home early Monday morning. Scotland Yard said the woman was released on bail and is scheduled to return to a London police station in October. Brooks resigned on Friday as chief executive of Rupert Murdoch's News International, which published the News of the World. It was not clear how her arrest will affect the hearing Tuesday in the House of Commons. Committee member Louise Mensch, a Conservative member of Parliament, said the committee chair was "taking legal advice" on the situation. Wilson said that over the next 24 to 36 hours Brooks' attorneys will be in discussion with the select committee to see whether her appearance at the hearing is still appropriate. Mark Stephens, a prominent British media lawyer, told CNN the arrest was "somewhat theatrical," given that Brooks has apparently not been charged with a crime. Brooks had asked police since January whether they wanted to speak with her, but was told that was not needed, Wilson said. While she received a call Friday to come in Sunday and answer questions, she was not told she would be arrested on arrival, Wilson said, adding that it came as a shock to Brooks. Brooks is adamant that she is innocent of any wrongdoing, Wilson said. Brooks is the eighth person arrested in connection with the phone-hacking probe and the fourth arrested in the bribery investigation, police said Sunday. Two people, including Brooks, have been detained over both probes, meaning a total of 10 people have been arrested. News International said it would compensate those affected by its illegal phone hacking, cooperate fully with the police and had hired a law firm to "examine past failings" and recommend new procedures to make sure they are not repeated. Brooks on Friday resigned from her post as chief executive at News International, the British arm of Murdoch's News Corp. Hours later, her predecessor, Les Hinton resigned. Murdoch also visited Milly Dowler's family on Friday. Cameron has been among those publicly decrying the hacking, blasting Murdoch's company Wednesday as he launched a high-powered judge-led investigation into the nation's press. 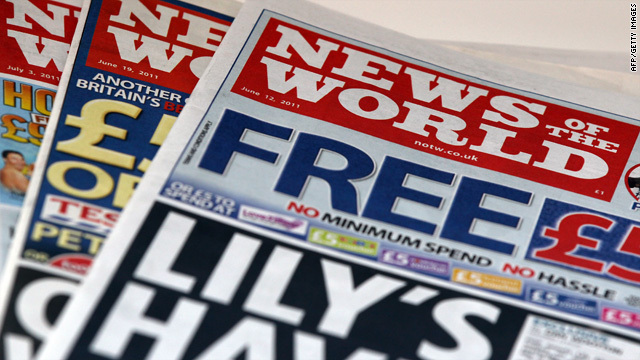 Coulson resigned as News of the World editor in 2007 after his former royal editor and a private detective were convicted of conspiracy to hack into royals' voice mails. But while offering his resignation, he insisted he had been unaware of the crimes and he was not charged at the time. CNN's Andreena Narayan, Atika Shubert, Anna Stewart and Bharati Naik contributed to this report.